Earlier this week, in our review of the Blu-ray set for Star Trek: The Next Generation Season 2, we proclaimed Data and Geordi "the original Troy and Abed." 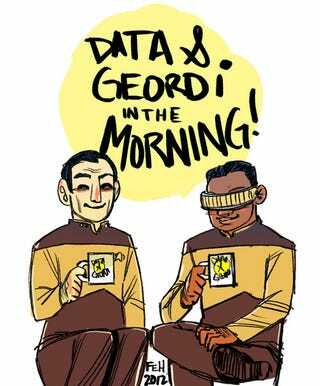 Cartoonist Faith Erin Hicks thought the same thing, coming up with this poster of pair hosting Community's imaginary morning show. Admittedly, I posted this earlier this week in the comments of the Blu-ray review, but I felt it warranted a bit more attention. After all, LeVar Burton has already appeared on Community; couldn't we get Brent Spiner in for one clink of the coffee mugs? Plus, it's an excuse to plug Hicks' amazing webcomic The Adventures of Superhero Girl (currently on hiatus) and Nothing Can Possibly Go Wrong, which Hicks draws and is written by Prudence Shen.